I so often am forced to say this, whether I am half way around the world or right here at home base, 'I live through the kindness of strangers'. So here I drive some 35 miles toward Grass Valley, and totally underestimated how bright an annular solar eclipse can be. As I drove up I watched the moon slowly obscure about half of the sun, then I pulled into the parking lot of a school, not far from where my friends used to have a lovely home. I set myself up, tripod and all, only to find out that even with two aviator sunglasses in front of the lens it was nearly impossible to get an image. I used my lens-cap behind the viewfinder, with the camera turned off, to watch the status of the eclipse projected onto the lens-cap. Then a family drove up and they had solar eclipse viewing glasses (paper frames) that they bought at UCS Davis. They kindly let me look through them and later sent one of their girls over with one and I quickly got a couple of shots off. Didn't want to monopolize them for too long, since eclipses don't stop. However, when I got home, I did discover some interesting results using the aviator glasses as well. Thanks for looking. The Map for the eclipse for Northern California. If you are where the red lines is, you will see the Moon dead-center of the solar disk. Anywhere between the blue lines, not near the red line, you saw what I saw. Interestingly, the mirror reflection on the aviator sunglasses was perfect. I held two pairs in front of my 55-200mm lens on my Nikon D7000. 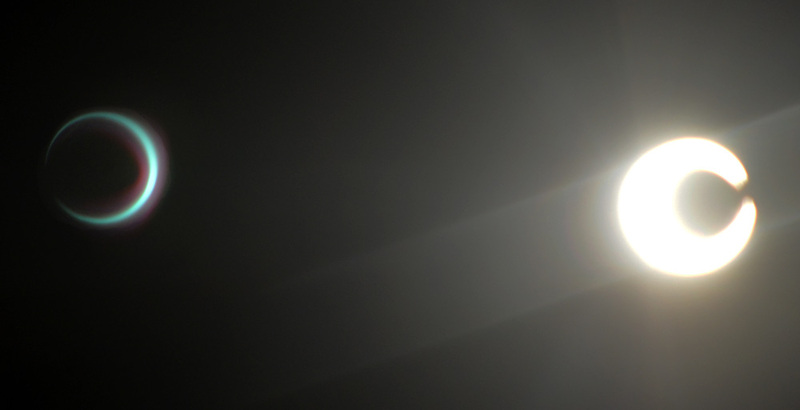 And this is the best I got with taking a moment to manually focus the lens while holding the special solar eclipse viewing glasses, my friendly parking lot neighbors let me use, in front of the lens. 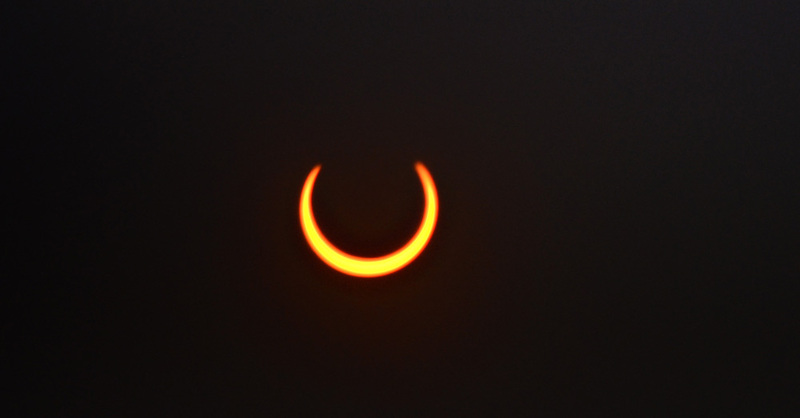 This was past optimum, and the Moon was moving off the solar disk. 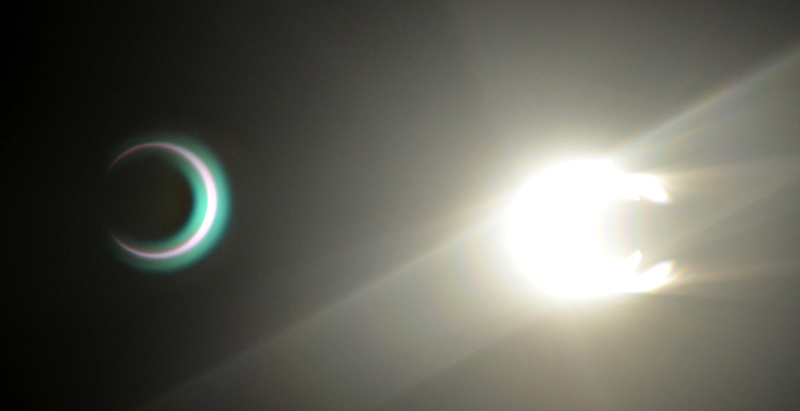 You can see in this and the preceding pictures that this was, indeed, an annular eclipse, meaning that the Earth (which is not in a perfectly circular orbit around the Sun) was closer to the Sun, making it slightly larger than the Moon. There is no totality possible at that time. Even if optimally positioned, right on the track, one can only get a bright circle around the Moon, not a total occlusion. Not all eclipses are identical. During my travels around Egypt in 2006, I happen to take a break under a cover, maybe a bus stop for locals, with a wooden roof. 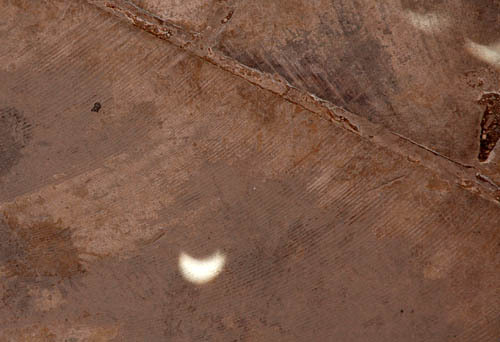 All of a sudden the sky dimmed and I just assumed that a cloud had moved in front of the sun, when I noticed on the floor and the walls, projected, as from a pinhole camera, a partial solar eclipse from every little crack and hole in the roof panels.